The names Riddet and Peren are famously synonymous with Massey University’s origins. Now, a just-published new history by eminent historian Professor Michael Belgrave sheds light on some unsung heroes as it vividly brings to life people, events and developments that have shaped the institution since its inception in 1927. At the launch of his book, From Empire’s Servant to Global Citizen – a History of Massey University (published by Massey University Press) this week, Professor Belgrave says writing the book – which he calls a “biography” of Massey – was partly a quest to explore his visions of earlier, idealised university life. The appeal of the handsome, richly illustrated 526-page book is its fascinating slice of New Zealand social history spanning several wars, the Depression and more, through the frame of Massey’s evolution from agricultural college to a modernist, multi-disciplinary, multi-campus university. 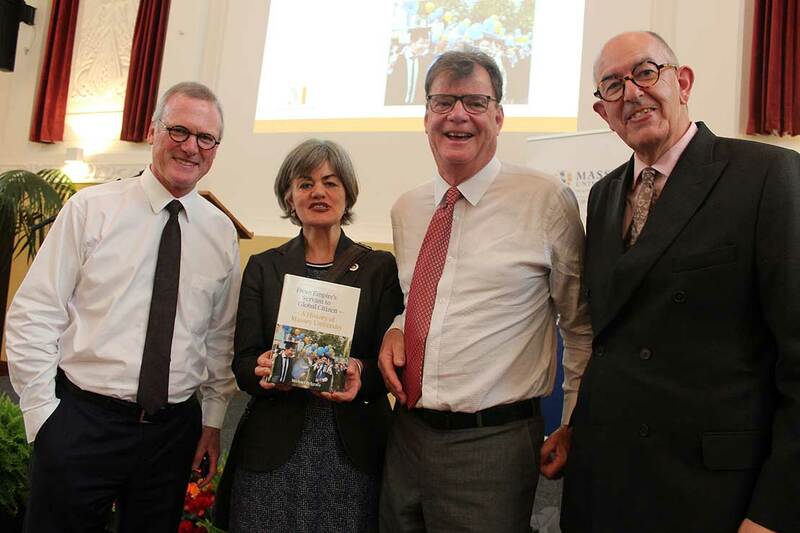 It is also an insightful history of tertiary education in this country, according to the Court of Appeal President Justice Stephen Kos, a former Massey University Chancellor who formally launched the book at the Sir Geoffrey Peren Building Auditorium on Wednesday. 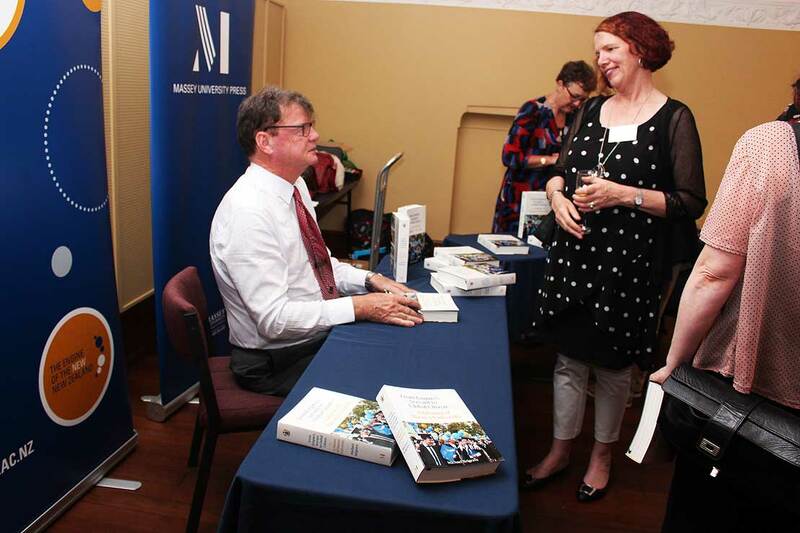 In his speech at the launch, Professor Belgrave said a key aspect of his book is that it considers the future challenges for the University in light of the past, at a time when the future of tertiary education is uncertain and contested. Ten chapters cover Massey’s early days when New Zealand was “firmly part of the British Empire, entrenched in its role as Britain’s farm” and the local and international context surrounding Massey’s creation as an agricultural college. As well as architectural history, responses to major social and cultural shifts and trends are entwined in the story of Massey becoming a university in 1964. This milestone required a shift from applied learning to more universal academic interests – pure sciences and the humanities and education – that make an impact on the wider community and world. Colourful evocations of campus and student life, and of the contributions of influential, academic staff members are intermingled with commentary on the deeper, broader role of education in society. One of the heroes of book for the author is Welshman Professor Sir David Hughes Parry, author of the 1966 Parry Report, which overhauled the funding and structure of tertiary education in New Zealand. “He pointed to an educated future that wasn’t just about jobs but was about an informed, culturally aware [people] with a knowledge of our history and identity in the Pacific as being a key part of the development and growth of New Zealand,” Professor Belgrave said. Introducing the launch, Vice-Chancellor Steve Maharey said he was “extremely excited” at the publication of the book, and congratulated publisher Nicola Legat for what is her eighth book since the press began 16 months ago. He told the audience it was well worth reading, quipping that staff would have to do so to find out if they featured in it because there is no index. Professor Belgrave says he hope the significance of his work is in elucidating the value and necessity of universities for a healthy, civilised society. “The values of open debate and evidence-based debate seem to be crumbling before us, including in the political establishment and the media,” he said, alluding to the election of Donald Trump as President of the United States last month. Michael Belgrave joined Massey University in 1993 on the opening of the University’s Auckland campus. A historian and previously a research manager at the Waitangi Tribunal, he taught in the social policy and social work programme until 2014, as well as Māori studies and history. In 1995 he began a long involvement with social workers and schools, managing and evaluating Massey University’s pilot of the programme, and becoming the leading advisor and evaluator in the development of a government pilot and in the generalisation of the programme throughout New Zealand. The programme is now provided to all decile 1–3 schools. He continued to maintain a strong interest in Treaty of Waitangi research and settlements, providing substantial research reports into a wide number of the Waitangi Tribunal’s district inquiries. More recently, he has been heavily involved in assisting iwi in negotiating the historical aspects of Treaty settlements. He has published widely on Treaty and Māori history, including being lead editor of Waitangi Revisited: Perspectives on the Treaty of Waitangi (Oxford University Press). He received a Marsden Fund award in 2015 for study into the re-examination of the causes of the New Zealand wars of the 1860s. 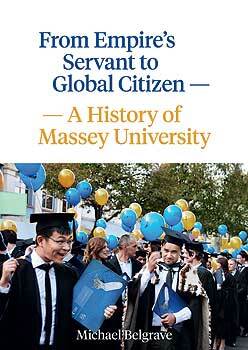 Read 10 Questions with Michael Belgrave on the Massey University Press site here.